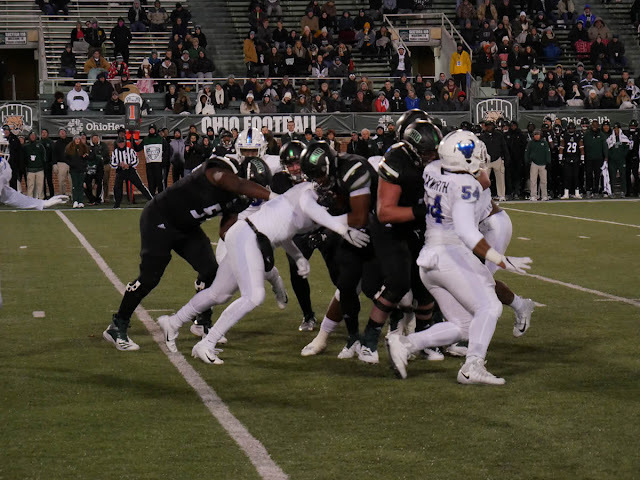 ATHENS, Ohio – In a series won by the home team every year since 2010, Ohio held serve, defeating the University at Buffalo football team, 52-17, at Peden Stadium on Wednesday night. It was the Bulls first conference and road loss of the season. At 9-2 overall and 6-1 in the Mid-American Conference, Buffalo will play at Bowling Green ­­next week with a chance to clinch to MAC East Division title. It was a promising start for Buffalo as the Bulls drove 75 yards on seven plays and scored on a four-yard touchdown run by Tyree Jackson on their first possession of the game. Jackson connected with Anthony Johnson on a 48-yard pass play on third down to help set up the score. However, the rest of the night belonged to the Bobcats. Ohio capitalized on three first-half Buffalo turnovers and scored on seven straight possessions to build their lead. Trailing 24-7 midway through the second quarter, Jackson ripped off a 55-yard to the Ohio five-yard line before having the ball jarred loose and recovered by the Bobcats. That's the kind of night it was for the Bulls. Johnson had six catches for 95 yards in the game to lead the offense. Jackson had a season-high 70 yards on three carries to lead Buffalo's rushing attack. Kevin Marks rushed for 54 yards on nine carries and scored on a 14-yard touchdown run for his ninth score of the year. Ohio, the preseason favorite to with the Mid-American Conference, rushed for 437 yards in the game and dominated the line of scrimmage. Brandon Williams had a career-high 11 tackles for the Bulls. Khalil Hodge also had 11 stops and added his first interception of the season. Buffalo will next play at Bowling Green next Friday at noon. If the Bulls defeat the Falcons they will win the MAC East crown and earn a trip to Detroit to play in the MAC Championship.